CHENEY, Wash. – After a strong performance in the first half by the Nicholls State University football team, No. 3-seed Eastern Washington changed the momentum of the game with a blocked field goal returned for a touchdown, and the Colonels went on to be defeated, 42-21, in the second round of the FCS playoffs Saturday evening at Roos Field. With the loss, Nicholls finished the year at 9-4, with the nine wins being the second-most in school history. Eastern Washington improved to 10-2 and will host next weekend’s quarterfinals game. The Colonels held a 14-3 lead after rushing touchdowns by Chase Fourcade and Dontrell Taylor through the first 17 minutes of the game. Nicholls was set up for a field goal right before the break, but the attempt was blocked by Dylan Bedletter, and Kedrick Johnson scooped it up for a 55-yard return for a touchdown. The score started 39 straight points for the Eagles before Fourcade rushed for a 34-yard touchdown to make the final. Fourcade threw for 146 yards on 17 of 30 and matched his career high of 89 yards rushing. A 16-yard completion to Damion Jeanpiere, Jr. in the second quarter put Fourcade No. 1 on the Colonels’ all-time passing list, surpassing Doug Hudson’s mark of 7,670 yards set in 1986. Fourcade’s two rushing TDs gave him 13 for the season, tying Broderick Cole’s single-season record (2005). Nicholls churned out 235 yards rushing, led by Taylor’s fifth 100-yard game of the season as he totaled 112 on 20 carries. But Taylor had one of the Colonels’ two turnovers in the second half, along with a pick-six by Fourcade. Eastern Washington was fueled by Sam McPherson, who rushed for 137 yards and two touchdowns. Most of the damage came in the second half, including a 34-yard touchdown run that gave EWU a 35-14 lead in the fourth quarter. He was only the second 100-yard rusher against the Colonels this season, leading to 237 yards rushing for the Eagles. Khristian Mims led the Colonel defense with a career-high 11 tackles and had an interception on the game’s opening drive. The turnover made way for a 1-yard sneak by Fourcade for the first touchdown of the day. The Eagles drove down inside the 5 on their next drive, but the Colonels stuffed a third-down rush and limited them to a field goal. Early in the second, Taylor went untouched from three yards out for a 14-3 advantage. The drive was kept alive on a 14-yard pass from Fourcade to Arron McKenney on third-and-10. Both teams had chances to score in the second, but Lorran Fonseca missed short on a 50-yard field goal for the Colonels. The Eagles had another successful drive deep into Nicholls territory before Hezekiah White forced a fumble on a Tamarick Pierce rush, and Corey Abraham came away with the ball at the 12-yard line. Nicholls marched down the field looking to go up 17-3 with the field goal attempt with seconds on the clock, but the block and return put the score at 14-10. In the third, Eric Barriere gave EWU its first lead of the night on a 34-yard touchdown pass to Andrew Boston. After the Colonels punted for the second-straight drive, the Eagles added a field goal for a 20-14 lead heading into the fourth. Nicholls had its first turnover of the night early in the final period as Taylor lost the ball at the Colonel 30 after hauling in a reception. EWU ran a half-back pass by McPherson for a big gain and he then ran in for a 4-yard touchdown, making the score 28-14 after a successful two-point try. The Colonels continued to struggle on offense with another 3-and-out, and McPherson scored again, this time from 34 yards out. Fourcade then threw an interception in the red zone and it was returned 95 yards by Ketner Kupp for EWU’s final touchdown of the night. Despite the loss, the Colonels set several milestones this season. 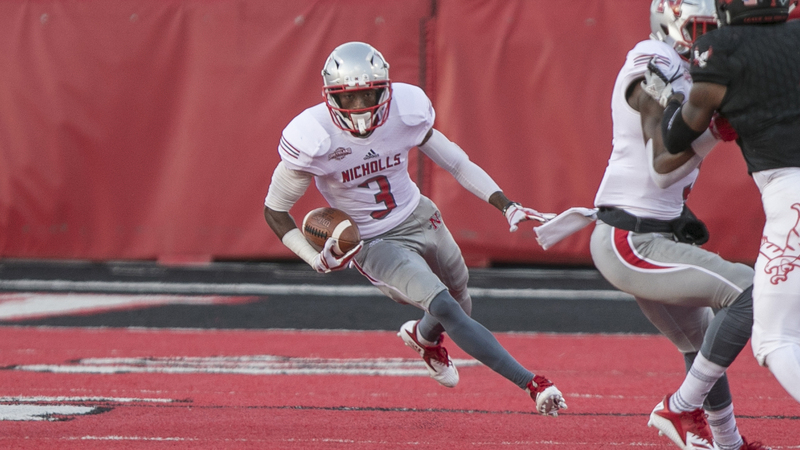 Nicholls won its second Southland Conference title and claimed its second playoff victory in team history. In addition to Fourcade’s records, Taylor, a junior, set a new program mark with his ninth career 100-yard game.